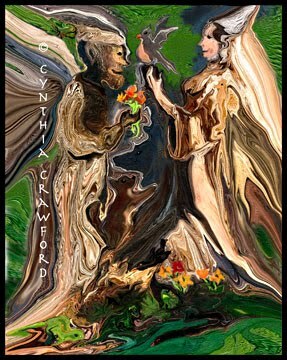 Creature Kinships and Natural Affinities: About my "Photo-Paintings"
I enjoy photography and painting, so why not combine them? This is what I've been doing with some of my photos. 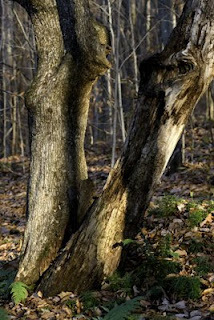 "Hornbeam Gifts" originated as a photograph of two old Hornbeam (Ironwood) trees on my property. They were leaning towards each other, suggesting some sort of alliance. I started playing in Photoshop with the liquefy filter, which stretches and swirls things. The two characters gradually emerged, and the shapes around them suggested various animals. Some of the parts were "painted" in with Photoshop brushes. You can see the final result on the side bar-"Hornbeam Gifts" Click on that picture to see a bigger one. How many critters do you see?